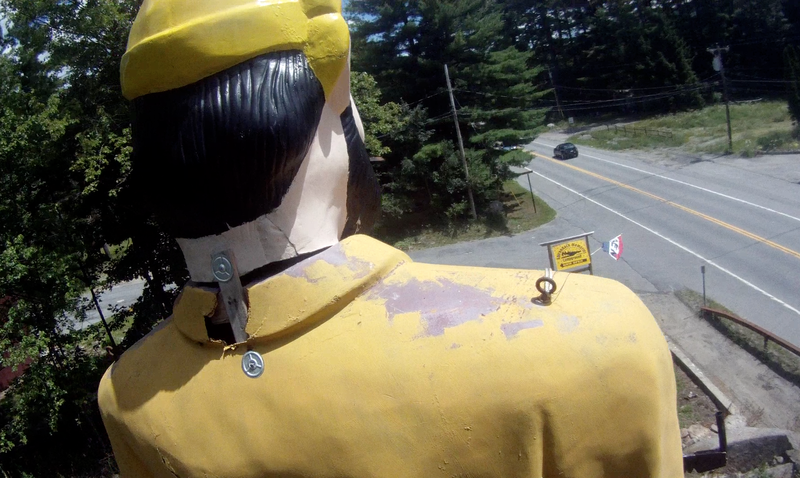 The Lake Luzerne Muffler Man statue has always been one of my favorites. 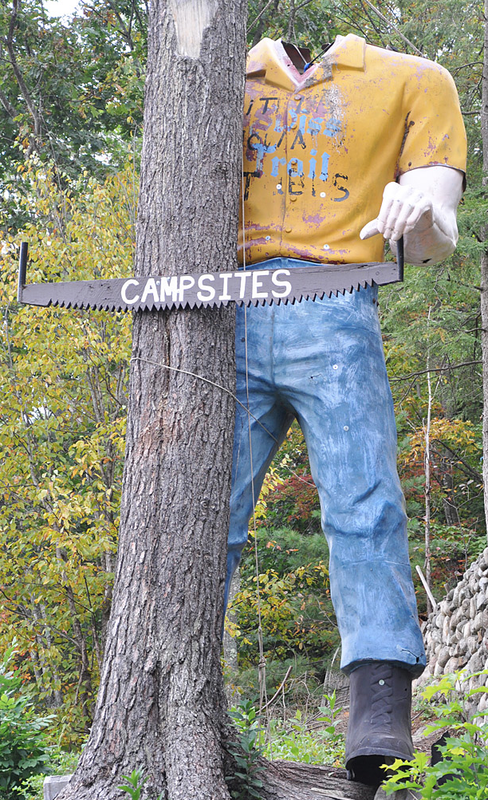 Ever since I saw a photo at RoadsideAmerica.com of this Paul Bunyan standing in the woods without a head and coming apart at the waist, this unfortunate statue has intrigued me. 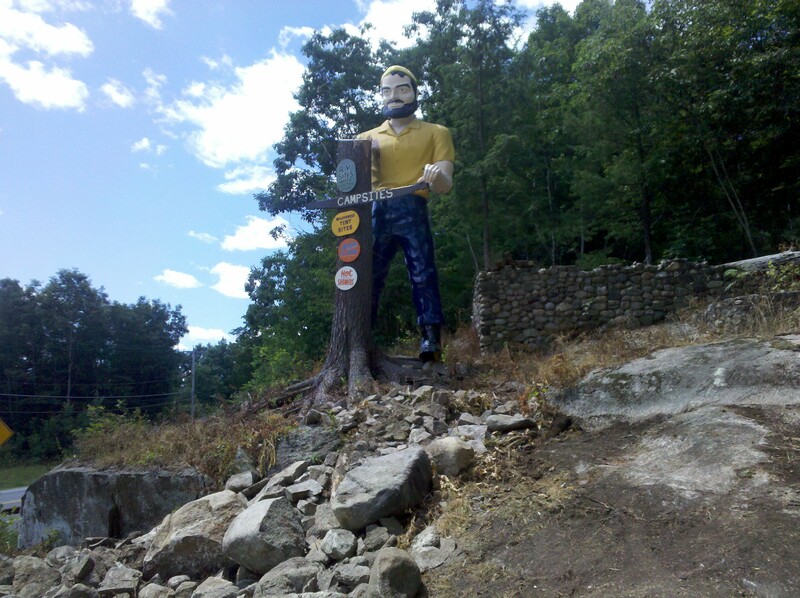 It is located near Lake George, NY where there are five other Muffler Men. Among them is the statue from the 1964 World’s Fair in New York now standing at Around the World Mini Golf in downtown Lake George. 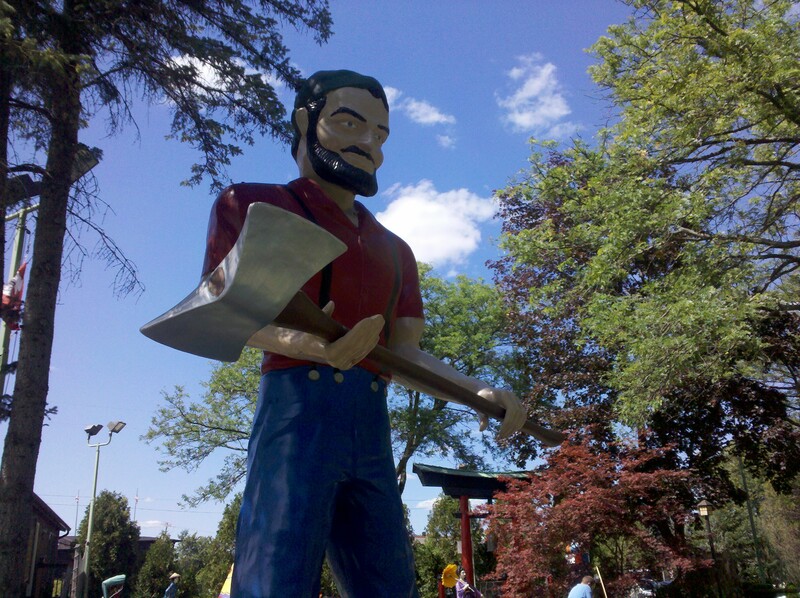 The rest of the area’s Muffler Men are located at Magic Forest, a recreational park for children. It is not known when the Lake Luzerne statue arrived. The earliest report is that it was already installed at the Swiss Campsites entrance in 1976 when the parents of Lynn Kinsman purchased the property. Her parents changed the name of the campground to the Swiss Trail Campground and repainted the statue’s shirt to reflect the new name. 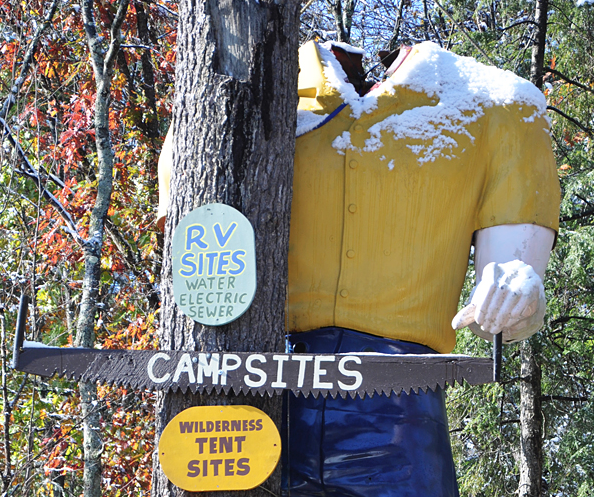 After they sold the campground in 1985, the statue began falling apart and vegetation began obscuring it from view. managed to get it across the road by using the nose and ears as handles. Getting the bulky head into the van was even more challenging and stressful. Dogs were barking and cars passed by now and then. The next day, the head was the talk of the agility trial. Everyone wanted a look at the bearded Bunyan face under the tarps. Debra Jane’s next challenge was getting the head into her New York City apartment. It just barely squeaked through the door. For the next eight years, the head lounged comfortably next to a radiator in her apartment. From time to time, she considered returning it. Then, in September 2010, David Magliato posted a comment on RoadsideAmerica.com. He had recently purchased the Swiss Trail Campground and renamed it the Adirondack Memories Campground. One of his first orders of business was the Muffler Man. 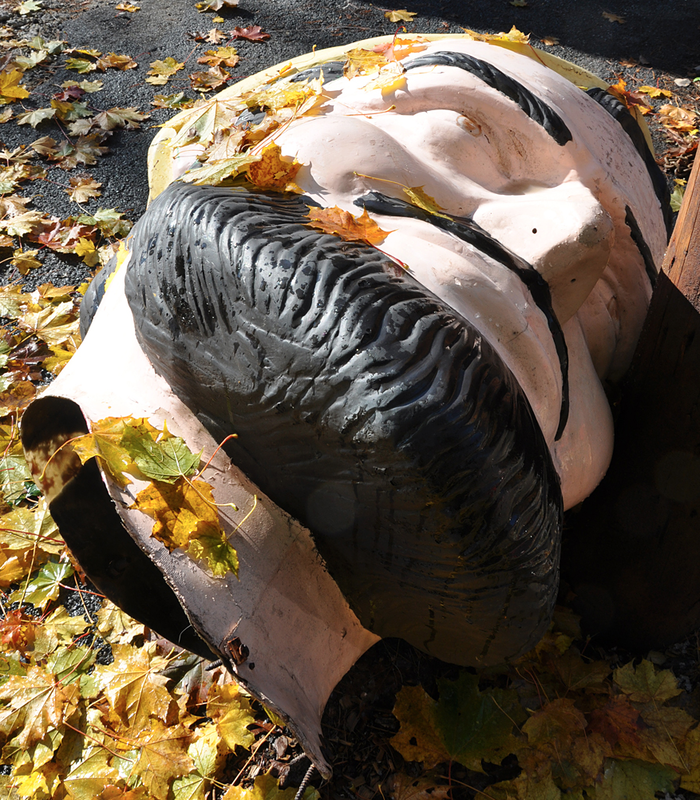 In his on-line comment, he expressed his desire to restore the statue and inquired if anyone knew the whereabouts of the head. 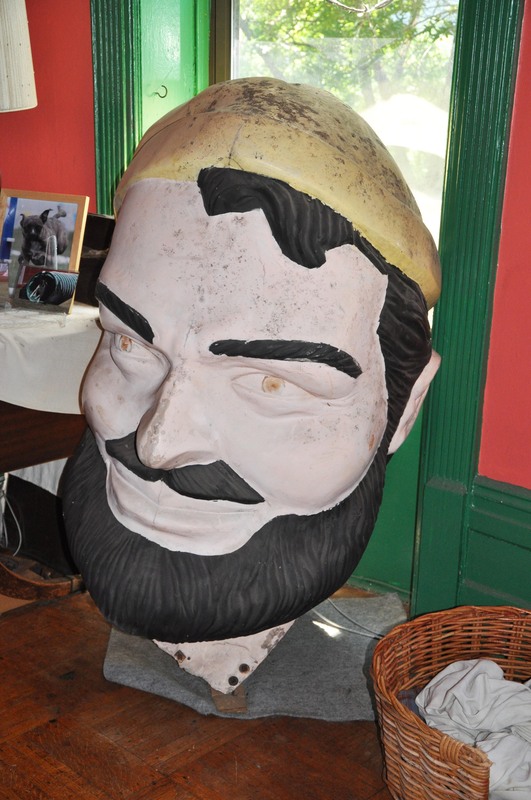 After reading the comment, Debra Jane made a pilgrimage to return the head in 2011. When she arrived, she noticed that the statue had been repainted and looked great with the exception of the missing right arm and head. There was no answer when she knocked on the door of the house next to the statue. So, she placed the head next to the garage door and hoped for the best. The following summer, I was visiting many of the New York Muffler Men. I drove to the Lake Luzerne campground on July 9th. To my surprise, when I rounded a bend in the road, I saw that the statue had been re-headed. 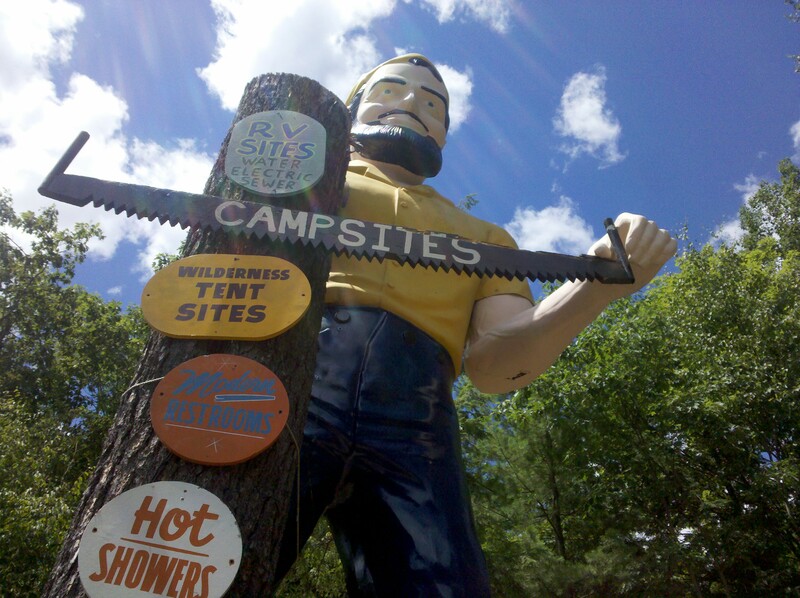 The Paul Bunyan stood on a hillside next to the road holding a big saw. The head had been repainted to match the recently painted body. Shortly afterwards, I posted my discovery at RoadsideAmerica.com. Debra Jane was delighted to learn that, after all these years, the head had finally made it back on top of those broad shoulders. She said later, “It was a pleasure having the giant’s company all those years. 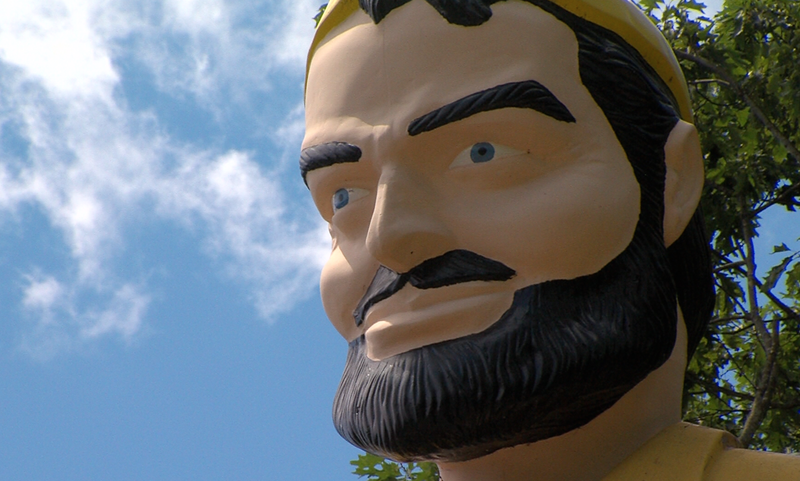 But it is a far greater joy to know the head has been reunited with its body and in public where it belongs.” The Muffler Man is still missing his right arm. Maybe that, too, will turn up one day or a replacement will be installed. Special thanks to Debra Jane Seltzer for her help in editing and to Roadside America for the information they have shared.